Located about a 15 minute drive from world famous Byron Bay, is the historic 1800s village of Newrybar. This tiny picturesque town, which has a population of less than 500 and is set amongst the lush green hills of the northern New South Wales hinterland, has become a must-visit destination due in part to its unique shops and restaurants. One of the main drawcards is Harvest, a collection of lovely old buildings housing a restaurant, bakery and deli. The restaurant serves up delicious meals which make good use of the best local produce grown in the area (and it’s own edible garden) that can be enjoyed inside by a crackling fire in cooler months or on a lovely long verandah in summer. With an Age Good Food Guide Hat and a laid-back vibe it is a must visit foodie destination. The bartenders also serve up a mean cocktail, and there is an impressive wine list, making it an ideal spot to enjoy a long, lazy lunch. There are some lovely stores in the town including an antique store (great for hunting for unique pieces), Driftlab and Newrybar Merchants, which is a collective of artists products beautifully showcased under one roof. Think beautiful linens, homewares, art and textiles from Tigmi Trading, Shannon Fricke, Uscha, The Society Inc by Sibella Court among many others. Olivia Newton-John’s Gaia Retreat and Spa is just up the road so if you feel in need of a massage and some pampering we highly recommend a visit. 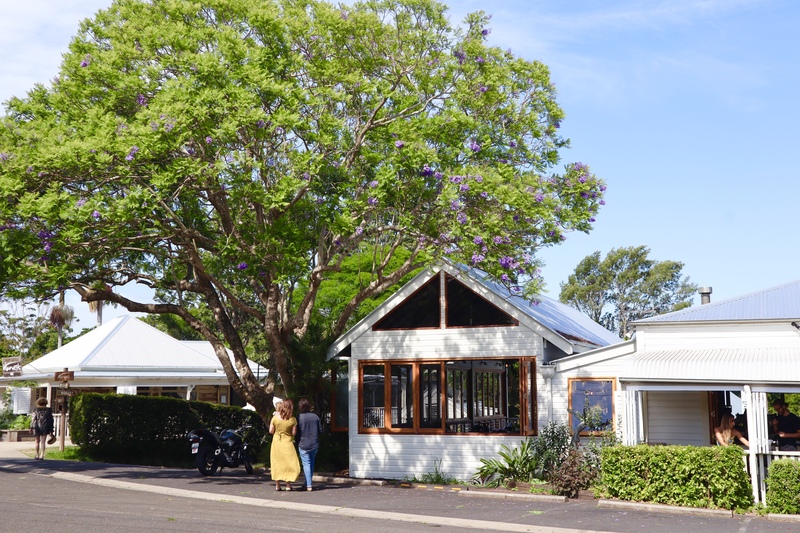 There are limited accommodation options in Newrybar itself (try Airbnb for private rentals), however as it is located so close to Byron Bay and surrounds there are plenty of options within a short drive from the village. We highly recommend hiring a car to explore the area and visit the region’s world famous beaches. Newrybar makes a wonderful day trip from Byron Bay, or a destination to base yourself when visiting the area. If you plan to dine at Harvest we recommend booking in advance so that you don’t miss out. Want more small towns and villages to explore? Click here for historic Maldon in Victoria, Australia and here the very pretty Arrowtown in New Zealand’s South Island. This is on my “must visit” list for my forthcoming trip to NSW and QLD in August.